Today is Opening Day of the Major League Baseball season. 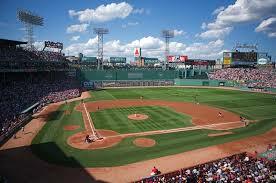 I have been at least a casual baseball fan for much of my life (and by “casual,” I mean that I’ve always been at least nominally a Red Sox fan), but I really fell in love with the game about ten years ago, when I moved to Boston. There are a number of aspects of baseball that appeal to me. I love the history of the game; it is humbling to know that some MLB franchises have been playing since the Gilded Age. I love the liturgy of the game; there is something very comforting about the unnecessarily detailed rules that are a central part of the game, like this unnecessary and beautiful ritual: whenever a pitching change is made, the manager walks all the way out to the mound, takes the ball from the pitcher, and hands it to the reliever. I love the pace of the game; baseball is the athletic equivalent of Sabbath: it encourages us to slow down in the midst of our busy lives and experience the wonder of life. The main reason I love baseball as much as a I do, however, is how well the sport embraces failure. There are 162 games in the Major League Baseball season. The Boston Red Sox, who were the World Series champions last year, won 97 of these 162 regular season games. In spite of the fact that they lost 65 games, they were crowned as the best team in baseball. Even more dramatic is the fact that Ted Williams, one of the greatest hitters in history, had a single-season batting average of .406. This means that in his best season, Teddy Ballgame himself was unsuccessful at the plate almost 60 percent of the time. The best hitters playing today tend to have batting averages around .300, which means that they fail 70 percent of the time. Baseball players and fans know how to deal with failure. And this shapes the way that baseball fans look at the world, especially on Opening Day. Every team begins the season with a mathematically equal chance of going to the playoffs, and even fans of historically bad teams hold on to this hope. In spite of past failures, we always know that there is a possibility for redemption. For baseball fans, the past does not dictate the future; instead, the future is shaped by boundless possibility. I think the same can be said of the Christian life. At its best, the Church is deeply aware of the reality of human failure, of the fact that sin is part of the human condition. At the same time, the Christian community is also deeply aware that in spite of our human failings, there is always a possibility for transformation. Paul tells us that Christ reconciled us to God while we were yet sinners. God was aware of our human frailty, and held out the hope of redemption in spite of our inability to recognize God’s love. We must remember that in the Church, the past does not dictate the future; instead, our future is shaped by the boundless possibilities available to us when we ground our life in God. If you were to do Gospel of John Mad Libs, you might end up with the passage we read in church this morning. John 9 has a little bit of everything: the healing of a blind man, disputes with the Pharisees, controversies around the Sabbath, and the inability of two groups of people to understand what the other is saying. The chapter is essentially a list of John the Evangelist’s greatest hits. In spite of this implicit richness, there are many who are inclined to read this as a simple story of a miraculous healing: Jesus makes mud, spreads it on some guy’s eyes, and he is able to see, even though he was born blind. This is understandable in some ways. After all, the man’s story about what happened to him is pretty simple: “The man called Jesus made mud, spread it on my eyes, and said to me, ‘Go to Siloam and wash.’ Then I went and washed and received my sight.” He repeats a version of this several times throughout the passage, always with the same dry rehearsal of the facts. 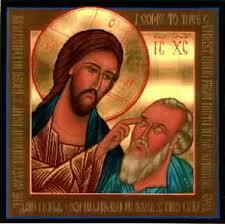 This is ultimately the source of the misunderstanding between the man born blind and the Pharisees. The Pharisees looked at a man who had been blind from birth, a man firmly in the “sinful” category, and saw that he was no longer blind, that he could no longer easily be considered “sinful.” Instead of reevaluating their categories, the Pharisees try to prove that there’s no way the man could have actually been healed from his blindness. It’s almost hilarious: they assume that the guy is impersonating the real blind beggar, they ask his parents to explain what’s going on, they repeatedly tell the man that he was born in sin. In the meantime, the man repeats over and over, “One thing I do know, that though I was blind, now I see.” The Pharisees refuse to recognize that the man has been healed, because in their worldview, people born in sin do not change, and are certainly not changed by people who don’t observe the Sabbath. The Pharisees refuse to change the way they look at the world. They refuse to see beyond their limited categories of “sinful” and “righteous,” and so they fail to recognize the truth when it stares them directly in the face. While the Pharisees are clearly in the wrong in this passage, I suspect that more than a few of us have shared a worldview with the religious authorities of John’s gospel at some point in our lives. We like to put things in categories, to keep things organized. When we are organizing our closets, this is not a bad thing. But this is a dangerous habit to indulge when we are talking about other human beings. When we look at a person and make a determination about who he is based on how he looks, we are falling into the same trap as the Pharisees. When we think we know a person just because we know where she’s from, we are failing to recognize the truth. God calls us to look beyond our limited worldviews and appreciate the people of this world for who they are and who they can be, instead of who we think they ought to be. Over the past several weeks, my wife and I have been ardent devotees of the Tonight Show. Every weeknight at 10:34 (CDT), we stop whatever we are doing and turn on the television to watch Jimmy Fallon host a 60 year old television variety show. We even watch the commercials. This happened quite by accident. When we saw that Jay Leno’s tenure as the host of the Tonight Show was coming to an end, we decided to watch his final show and take a look at Fallon’s first outing. Though we were immediately entertained and impressed, we didn’t think it could last long. Surely Fallon’s habit of breaking or laughing at his own jokes would invariably torpedo the show. We continued watching, mostly for the sick thrill of watching the show crash and burn. But something weird happened: it didn’t fail. In fact, it seems to have returned to the glory days when it was hosted by Johnny Carson. The Tonight Show has only gotten better, to the point that I can say with some confidence that it is currently my favorite thing to watch on television. How did this happen? How did a somewhat annoying television personality and his team revitalize a storied, yet struggling institution? It occurs to me that there are three things Jimmy Fallon does as the host of the Tonight Show. First, he has an enormous amount of respect, almost reverence for the institution that he has been tasked with stewarding. Fallon frequently makes reference to the Tonight Show’s storied past, celebrating the lives of those who have performed and been interviewed under its banner. Second, Fallon is willing to use new means to engage his audience. He is an avid user of social media and he encourages participation by the people watching at home. Even if you’ve never sent anything to the show, you get the sense that your opinion and your participation matters. Finally, Jimmy Fallon exhibits an infectious enthusiasm for his work. When he jokes with Higgins during his monologue or banters with The Roots during an interview or plays a silly game with his guest, he exudes a spirit of awe, a sense that he can’t believe he has the great privilege of doing what he does. All of these combine to create a Tonight Show that is engaging, innovative, and exciting to watch. It occurs to me that these three elements of Jimmy Fallon’s hosting of the Tonight Show are really important when we think about revitalization in the Church. In some ways, the Church and the Tonight Show have been in similar places: both are storied institutions that have been struggling with questions of “relevance” over the past few decades. 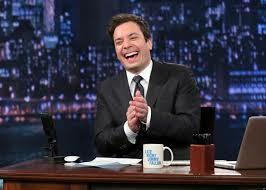 I think, however, that Jimmy Fallon shows us a few things we can do to breathe life into our church communities. First, we can have respect for the institution we have been called to steward, to recognize that we stand on the shoulders of those who have come before us, from apostles and martyrs to church members of generations past. At the same time, we must be willing to try new ways of engaging with the people in our communities, whether that is through social media or other means. People should be able to look at our churches and feel as though they are connected to them, even if they’ve only visited once or twice before. Finally, and most importantly, we must recognize what a great privilege discipleship truly is. We have been given a wonderful inheritance and a wonderful opportunity to serve Jesus Christ in the world. I pray that each one of us will have grace to recognize this opportunity and embrace the community we have been called to serve. Please note: the following post reflects on the Disney film Frozen and necessarily contains spoilers. If you haven’t seen Frozen yet, stop reading this post and go see it, because it’s awesome. I’m not sure if you noticed, but for the first time in a number of years, everyone is talking about an animated movie made by Disney. Frozen is the first Disney movie in a long time that comes close to achieving the quality of the films it released in the 1990s, including classics like The Lion King, Beauty and the Beast, and Aladdin. Already it has had a profound influence on the culture, inspiring parodies, lip dub videos, and sing- alongs that have gone viral. The movie has transcended the “kids movie” genre and has become a surprise hit, not only among nostalgic lovers of the old Disney favorites, but also among those who want the movies they watch to have a deeper meaning. In some ways, it’s no surprise that Frozen has been so popular. It ticks all of the appropriate Disney movie boxes: catchy songs, cute sidekicks, princesses, anthropomorphic animals, and parental tragedy. I think the reason for its near-universal popularity, however, is the fact that it is not hamstrung by its need to be a traditional Disney movie. Indeed, there are elements of Frozen that totally transcend the genre. For instance, Elsa and Anna (the princesses; yes, there are two), are far more three-dimensional than their historic counterparts. They struggle with the same issues that we struggle with: how to be ourselves in the face of societal pressure, how to trust people, and most of all, what the nature of love really is. THIS IS WHERE THE SPOILERS ARE. IF YOU HAVEN’T SEEN THE MOVIE AND DON’T WANT THE ENDING RUINED, PLEASE STOP READING! I won’t rehash the entire plot, but suffice it to say that in the final sequence of the movie, Anna is trying to be healed of a frozen heart caused by her sister Elsa. Told by one of the sidekick characters that the only way to heal a frozen heart is through an act of true love, Anna assumes, like a traditional Disney princess, that this act must be true love’s kiss. As she prepares to kiss the man with whom she has ostensibly fallen in love, however, she sees her sister in mortal danger. Instead of acting to save herself, Anna throws herself between Elsa and her would-be murderer. As the sword comes crashing down, Anna succumbs to her frozen heart and is frozen solid even as she saves her sister’s life. But after a beat, Anna gradually becomes unfrozen and kingdom is returned to normal. The sisters embrace and the implication is very clear: the act of true love was Anna’s sacrifice, her willingness to put her sister’s life ahead of her own. 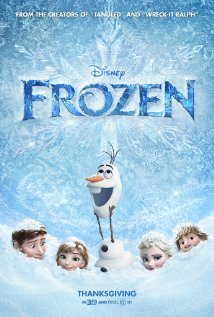 Several reviews of Frozen describe its ending as “revolutionary.” From the perspective of Disney princess movies in particular or children’s movies generally, it very well may be. It strikes me, however, that the notion of true love being embodied in sacrifice is an ancient idea. In fact, it lies at the very heart of our Christian faith. We believe that Jesus Christ manifested the true nature of God’s love to us through his sacrifice on the cross. The core affirmation of our faith is that God was willing to die on behalf of the world, even though the world had rejected God. And I suppose that this is a revolutionary idea. We tend to be seduced by the idea that love is contingent on whether the person we love does what we think they ought to do. Yet the heart of our religion is that God loves us with a love that is unconditional, sacrificial, and true. There’s a video making the rounds on various social media platforms. For those who didn’t watch, the video follows a man dressed like a waiter as he delivers meals to homeless people on the streets of Los Angeles. The meals are arranged on plate and require flatware. As he delivers the food, he says things like, “Sorry about the wait, sir” and “Did you have the chicken?” The people who receive these meals greet the guy with a mixture of surprise and appreciation. Towards the end of the video, we see one recipient share part of his meal with an acquaintance. On one hand, there is a very kitschy character to this video. It’s dripping with sentimentality and a little self-congratulation, and was clearly designed to be shared as many times as possible (I’m just doing my part). On the other hand, there is something very beautiful about this man’s service to the people in his community. By dressing up as a waiter and serving a meal that requires a fork and knife, this man starts with the fundamental assumption that everyone is entitled to their dignity, no matter what their life circumstances may be. More importantly, this video reminds us how important relationships are. After receiving their meals, nearly all of the recipients introduced themselves to the guy dressed as a waiter. Every encounter depicted in the video started a conversation. Notably, it was typically the people being “served” who took this next step in building a relationship. We often get caught up in the notion of doing things for those who are “less fortunate” than we are. In some ways, there is nothing wrong with this. If we have an abundance of something, we are called to share it. But this is very basic discipleship. This was the minimum standard that John the Baptist articulated to usurious soldiers and greedy officials at the beginning of Luke’s gospel. Jesus calls us to a much deeper level of commitment. Jesus tells us that if someone steals our coat, we should call them back and say, “Wait! Take my shirt too!” I don’t think this is because Jesus wants us all to walk around shirtless (ahem, Matthew McConaughey); I think this is because giving someone our shirt after they have our coat requires us to build a relationship. It requires us to call that person back and find out why they took our coat, to find out how we can work together to improve their experience of life. Ideally, we are called to do things with those who need help, to recognize that we are all part of the same creation, to embrace the fact that we are all people for whom Christ died. I have a bad habit of walking out of the house with my shoes untied. I don’t do this for any aesthetic or political purpose; I’m not trying to make a statement about needing to be liberated from whatever ties us down (though that sounds pretty good). Rather, I am simply too lazy to bend down the six feet required to tie my shoes. I generally get to the task around mid-morning, after more than a few people have seen my laces flopping around in the breeze. People who know me are aware of this aspect of my laziness; they have warned me about my untied shoes once or twice before and have been surprised when I’ve told them “I know.” In general, people will stop pointing out my loose laces after a few of these interactions. 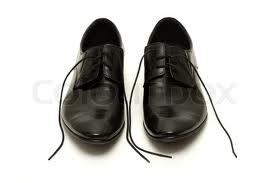 One of my good friends from seminary, however, would warn me every single time he saw me with my shoes untied. For him it was never a casual reminder, either. Untied shoes seemed to be a matter of life and death to him. Even after I told him explicitly about the nature of my shoe-related laziness, he would still drop everything he was doing to say, “Whoa buddy! Your shoes are untied! Be careful!” The funny thing is that this guy is not the most effusive man in the world. He has his moments of melodrama, but for the most part, he is very measured and not inclined to outbursts of any kind, particularly when it comes to other people’s business. Yet, for whatever reason, my friend reserves a special compassion for people whose shoes are untied. His warning is an emblem of a deep love that he has for his fellow human beings, one doesn’t appear in all situations, but is abundantly clear when the circumstances are right. I think that there are times when we feel overwhelmed by the need for compassion in this world. Everywhere we turn, there seems to someone who is hungry, thirsty, persecuted, or desperate to know love. One possible response to this is to up our hands and say, “There’s no possible way that I could do anything to alleviate all the suffering in this world, so I’ll just try to forget about it.” But as my friend demonstrates, we can let our compassion reveal itself in particular situations. We can try to alleviate the suffering of people we have relationships with; we can devote our energies to dealing with a particular issue. Above all, we can trust that every act of love we perform in this life is a way of building for God’s reign of justice and love. There are few things I find more frustrating than the moments after a televised sporting event. Of course, there is the dejection I’ve experienced as I watch the people who beat my team celebrate. There is the challenge of enduring the inane commentary from the play-by-play announcer and color commentator. The most frustrating moment of the post-game experience, however, is the on-field or on-court interview with the player of the game. It’s always the same: a person who is completely worn out is placed in front of a camera, reminded what a great game he or she had, and asked some obvious questions, inviting the regurgitation of some stock answers. It is an exercise in pointlessness. In fact, the only time in recent memory a post-game interview was remotely interesting, it stirred a controversy that lasted for weeks. We are much more comfortable with the tedious and predictable script, with the questions and responses we all expect. 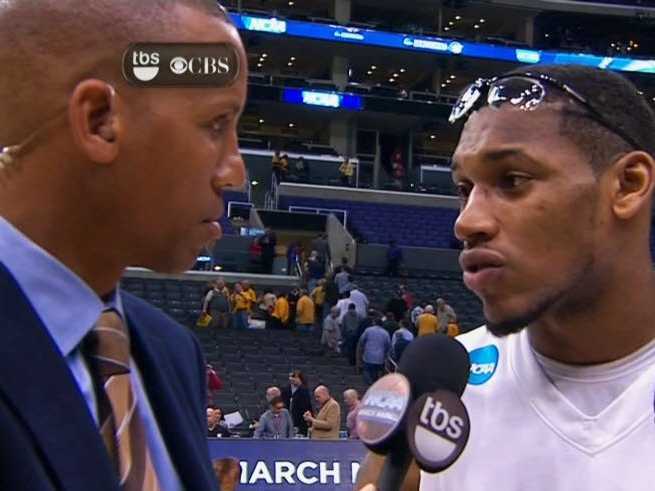 We’ll see versions of this post-game interview a lot as March Madness continues over the next few weeks. And when interviewers ask players what it’s like to play in the NCAA Tournament, one of the responses we’ll hear most frequently is, “We’re playing like it’s just another game.” I’ve always found this particular response to be patently ridiculous. After all, when was the last time these players played games that were broadcast on national television? When was the last time every game they played could potentially end their season? The notion that they could play like it’s just another game in such stressful circumstances seems unlikely to me. But of course, this is because I’ve never played basketball (or any sport, for that matter) at the elite level. This is a crucial distinction. The men and women who are competing in the NCAA Tournament train on a daily basis; they practice until every move they make on the court is in their muscle memory. They have the capacity to play stressful games like any other game because they have put in the hard work to be ready for any possibility that will come their way. Every aspect of their game is grounded in all they have done to prepare. It occurs to me that this is, ideally, how we should operate in our spiritual lives. We are encouraged to pray on a daily basis, not because God will be mad if we don’t, not because it’s the only way God will do what we ask God to do, but because prayer is the equivalent of athletic training and practice. Prayer is meant to help ground us in our relationship with God, to help us root our identity in the God who loves us. When we are grounded in this way, when we put in the hard work of spiritual discipline, we will be better equipped to deal with challenges when they come our way. Instead of being overwhelmed by stressful situations, we can rely on our spiritual practice and place our trust in the God whom we have come to know in our prayer lives. Lent is a way of engaging this training and practice, an opportunity to begin rooting our identity in God so that we will be ready for whatever comes our way.